Selecting the best colors is a key part of any graphic design project, yet most color pickers only display your chosen shades in tiny boxes. 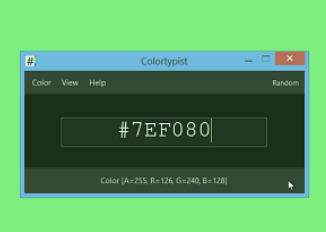 Colortypist is a portable Windows freebie which allows you type color names or codes and displays them full-screen, in real time. As you’d expect for a single 72KB executable, the interface is basic: just a text box and some menus. Still, it’s also very easy to use. Just type colors by their name (red, cyan) or code (HTML, RGB, integer) and that shade fills your screen. There’s a button to fill your screen with a random color, maybe useful if you need some design inspiration. If you find something you like, the code may be copied to the clipboard with a hotkey, ready for use elsewhere. What’s more of a surprise is that Colortypist can also generate a bitmap of your preferred size, using that shade, and copy it to the clipboard or save it as a PNG, BMP or JPG file. Bonus features include an option to save an HTML file which uses that color as its background, and you’re able to set your desktop wallpaper to the color in a couple of clicks. Put it all together and Colortypist is a smart graphic design addon, well worth its 40KB download. Go grab a copy now.